Be the first to share your favorite memory, photo or story of Hercilio. This memorial page is dedicated for family, friends and future generations to celebrate the life of their loved one. 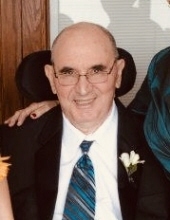 Hercilio Alexandre Nascimento, 73, passed away peacefully, at his home in Elizabeth, NJ on Tuesday, April 9, 2019, with his loving family by his side. He was born in Algarve, Portugal and came to the United States in 1971, resided in Newark, lived in Warren for over 40 years and has resided in Elizabeth for the past 4 years. Hercilio was in Real Estate for many years before retiring. Beloved husband of 47 years of Elisabete Nunes Dos Reis (Colmado) Nascimento; devoted and loving father of Paul Alexandre Nascimento, Melissa Reis Nascimento and Jennifer Reis Nascimento-Pestana and her husband Hugo; dear brother of Elionora Aleluia and her husband Eduardo; cherished grandfather of Holden, Hannah and Scarlett Pestana. The Funeral Mass for Hercilio will be offered on Friday, April 12 at 9:30 am at Our Lady of Fatima Church in Newark. Entombment to follow at Gate of Heaven Chapel Mausoleum, East Hanover, NJ. Relatives and friends are welcome to attend. Visitation for Hercilio will be held on Thursday, April 11th, from 6 - 8 pm at the Buyus Funeral Home 426 Lafayette St., at Wilson Ave Newark, NJ 07105. In lieu of flowers, donations to The Kessler Foundation 120 Eagle Rock Avenue East Hanover, NJ 07936 http://kesslerfoundation.org/giving/donate. And for anyone who would like to make a credit card gift over the phone or needs more information, please call or email Victoria Queyquep at 973.324.8449, or vqueyquep@kesslerfoundation.org. would be graciously appreciated. To send flowers or a remembrance gift to the family of Hercilio Alexandre Nascimento, please visit our Tribute Store. "Email Address" would like to share the life celebration of Hercilio Alexandre Nascimento. Click on the "link" to go to share a favorite memory or leave a condolence message for the family.